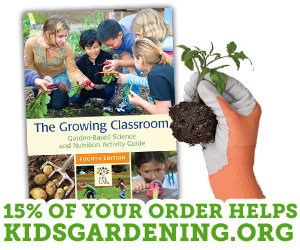 Overview: Weather plays a big role in the success of your school garden. This lesson offers ideas for homemade weather-tracking tools to help you learn how to observe rain, air pressure and humidity. Objectives: Students will learn how to track different types of weather components and understand their impact on plant growth. Background Information: Since weather is ever-present in schoolyards and gardens, why not learn to observe and make sense of it? School gardeners have good reason to be in tune with the weather. They need to know when conditions are right for seeds and transplants, when to protect tender transplants from frost, and when to provide "rain" when Mother Nature doesn't. What's more, by observing, measuring and describing weather, young gardeners can think and act like scientists, looking for patterns, making sense of data and predicting what the future will bring, meteorologically speaking! Ask students, what is weather? Next brainstorm a list of all the ways they think weather impacts their garden. How does tracking the weather help us as gardeners? Do you know of any tools to help us track weather? Container in hand, your young scientists will need a way to measure collected rain. One method is to mark a clear plastic straw with inches or centimeters (and fractions), and insert it to the bottom of the container daily or weekly, depending on how often you want to record your results. By putting a finger on top of the straw and withdrawing it, students will be able to keep the measured water within the straw as they remove it from the container and read the rainfall depth. Students might also make a tagboard ruler, cover it with clear cellophane, and tape it upright inside a glass jar, or simply attach a plastic ruler. Set your rain gauge outside, perhaps attached to a post or your weather station. (It is, after all, the one tool you don't want to keep under cover!) Make sure the remove the water from your rain gauge regularly to keep mosquitoes from breeding in it. Explore! Although a certain amount of rain may fall in your garden or schoolyard in a given period, not all plant roots will have the same access to it. For instance, water drains more quickly through sandier soils than through loamy or clay soils. Also, in a heavy downpour, much of the water that falls can run off the soil surface before soaking in. Rain that falls on planting beds that receive full sun may evaporate more quickly than water that falls on a shady spot. Encourage your investigators to observe the relationships among plants, water and other environmental factors, and conduct tests or research to answer questions that arise. Stretch a layer of balloon material or plastic wrap over the top of a jar or coffee can to form a membrane. Secure it with a rubber band, ensuring that there is a good seal so the can is airtight. Next, challenge students to figure out how to record the straw's movement. They might tape an index card to the can and record the location of the straw daily or place the barometer near a sheet of paper on a wall and record the straw's movement on the paper. Explore! What's happening? High pressure makes the balloon or plastic wrap cave in so the end of the straw will go up. Low pressure causes the membrane to puff out so the end of the straw will lower. Challenge students to track changes in air pressure over time and look for related patterns of changes in weather or in living things (including themselves!) How accurately can they predict storms using their barometer? From the piece of oak tag or thin plastic, cut a triangular pointer about 6 inches long (see illustration). Cut two slits at the bottom of the pointer about 1 inch from the left edge. Tape or hot glue a dime onto the triangle about 2 inches from the pointer's left edge. Cut two slits on the cardboard's top edge about 1/4 inch apart and 1 inch from the left side. Attach the pointer to the cardboard with a pushpin. Place it about 1/2 inch from the left edge and about 3/4 of the way down the side. Attach the hair strand by sliding it through the 2 slits at the top of the cardboard and those at the bottom of the triangle. Use tape or hot glue in both sets of slits to keep the hair in place. Push the pin through the pointer hole so the hair is slightly stretched when the pointer is horizontal. Wiggle the pointer up and down to make sure it can move freely. (The hair should hang vertically and the pointer should be horizontal. )The pointer on your hygrometer is now set to show changes in humidity. When there is a lot of moisture in the air (high humidity), the hair gets just a little bit longer. That makes the pointer droop lower. When the air gets drier (low humidity), the hair gets a little bit shorter and the pointer goes higher. Explore! Consider having students check relative humidity reported by meteorologists on the computer or radio for several days. Each time, they can draw a line at the tip of the arrow on their hair tool and compare to the data from official weather reports. Here are some questions your weather sleuths might investigate: Does the air feel different when the humidity changes? Do we notice any related changes in plants? Is there a relationship between shifts in humidity and the general weather? How do nighttime air temperatures, humidity, and the occurrence of dew or frost relate to one another? How do classmates' hairstyles vary with changes in the humidity? Weather or climate? Weather is the stuff that happens outside the window, and changes on a daily basis. Climate, on the other hand, refers to the average weather conditions in a region over a long period of time. Your area might experience a week of dry weather, but a place that doesn't get much rain over many years has a dry climate. Invite the class to brainstorm what the word "microclimate" might mean, then try to agree on a definition or description. (It refers to the climate of a small, local area that differs from the general climate because of differences in sun/shade, temperature, wind, or moisture.) Ask, What factors might affect the climate in a given location? Then have small groups investigate the school grounds, find places they think might have different microclimates, and describe each location. If they have measurement tools, encourage them to explore questions such as these: Which is the warmest? Coolest? What might have caused the differences (e.g., a building may provide shade and wind protection)? Other factors that can affect microclimates include manmade features (e.g., buildings or rock walls), geographic features (slopes), or living things (trees). Investigate plant preferences. Ask your class how they think different microclimates around the school might affect the growth of plants. Have them provide a rationale for their answers (for example, "Plants might grow more quickly in spot A because it gets more sun and moisture"). How might they test their hypotheses? A group of students could start several containers of one type of seedling using the same soil mix, container size, and so on, and then place each in a different location. They might track rainfall, soil and air temperature, and other factors; then chart the growth and development of plants in each site. What can we infer about the effect of microclimate on plant growth? What other factors might have influenced the outcome? Track seasonal natural changes Springtime in temperate areas brings longer days (more sunshine), warmer temperatures and rains. These factors, in turn, trigger sap to run, buds to swell and bloom, insects to hatch and birds to migrate north. The term for observing and tracking these seasonal changes is phenology. It all starts with the sun. As sunlight increases in the spring, plants break dormancy and start growing. Animals that eat plants soon appear. (In more arid areas, cooling temperatures actually trigger this greening.) Next, predators that feed on animals show up. (As plants begin to bloom, pollinating insects, birds and other animals hatch, wake up or migrate back.) As light decreases and temperatures drop in the fall, the reverse happens. Plants adapt by re-seeding themselves or going dormant; some animals hibernate and others migrate. As students attend to these changes in the schoolyard or larger environment, they become keen observers of the natural world, developing an understanding of natural relationships, recurring patterns, and the energy flow that fuels the cycles of life. Have students brainstorm signs that spring (or fall) is approaching, and then keep notes on related observations in the schoolyard, woods or native plant garden. They might choose to focus on certain plants and set up a routine for collecting data on certain occurrences: buds opening, first leaves appearing, fall color changes and so on. They should also be sure to note climatic factors, such as air and soil temperatures, precipitation and day length, that coincide with changes in living things. Questions about animal "happenings" should also arise. For instance, When do certain birds return or leave? When the Monarch butterflies return, how big are the leaves of its larval host plant, common milkweed? Does the appearance of bird and insect pollinators coincide with changes in plants? Explore additional weather tools. One readily available tool is a maximum/minimum thermometer. Your kids can use this tool to keep track of nighttime lows and daily highs. It's particularly useful for those who garden in greenhouses and other structures where temperatures can reach extremes.